Tattoo Shop Loyalty Program - Reward your customers! Get an edge over the competition with your own loyalty program. Loyal customers spend more money. In a nutshell: Loyalty Gator is an affordable customer retention program that's customized for your business! Increase Traffic, spending, and word of mouth with a rewards program for your customers. Plus, start tracking your customer activity to pin-point your most loyal patrons, how often they're visiting, and what drives them. 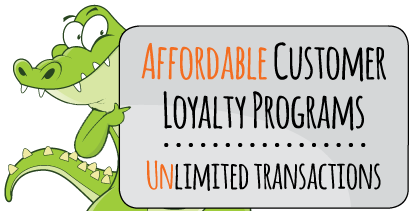 How would you use loyalty gator to benefit your tattoo shop? Trackable promotional incentives such as "buy 3 hours, get 1 free"
The options are endless... Tell us how you want to create your own custom program or allow our loyalty experts to develop a custom solution just for you. Contact Us to learn more about how a loyalty program can benefit your business!